Historic Beer Birthday: Michael Hand, Jr.
Today is the birthday of Michael Hand, Jr. (September 12, 1866-1915). 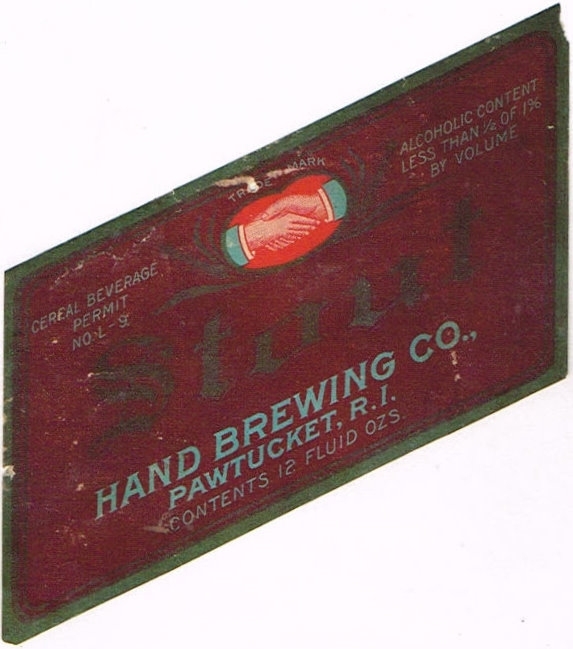 He was the son of Michael Hand Sr. , who founded the Michael Hand Brewing Co. in Pawtucket, Rhode Island in 1898. Michael Jr. joined the family brewery and the two of them ran the brewery until Sr. passed away in 1911, and Jr. then became sole owner and continued running it until his own death in 1915. His widow, Annie continued the brewery until it was closed by prohibition. 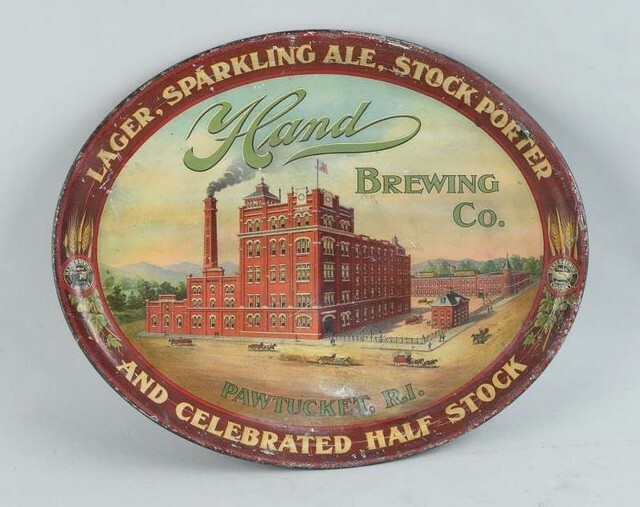 A local beer distributor, James Lavell, who also had a realty business, tricked her and ended up owning the brewery, and also went to jail, but after prohibition ended, he reopened it as the Rhode Island Brewing Co. It remained in business for just five years, closing for good in 1938. 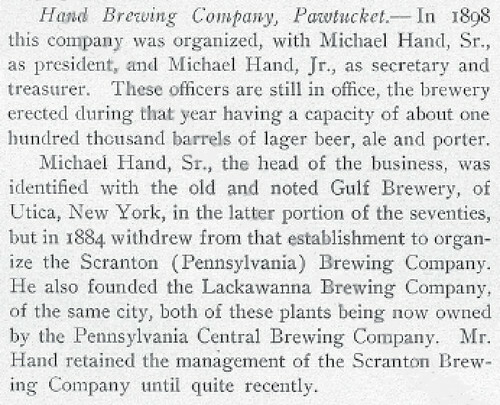 The brewery was built by Michael Hand of Scranton, Pa., in 1898 and run by Hand and his son Michael Jr., of Pawtucket, until their deaths in 1911 and 1915, respectively. The younger Hand’s widow, Annie, was left to run the brewery, which still brewed beer, even during prohibition. Operating out of a tiny building housing Beacon Realty on Fountain Street in Providence, beer distributor James Lavell took orders and cash for the hooch he made at the Hand Brewery. He ended up in jail, but not before his Crescent Realty had loaned money to Annie Hand, secured by the brewery, and then foreclosed on the mortgage, becoming its owner as prohibition ended. A portrait published in Western Brewer Magazine, 1883, from the Collection of the Historical Society of Washington, D.C.
Born in 1842 in the village of Haina, near the town of Römhild, Duchy of Saxe-Meiningen (in the region of Thuringia), Christian was the third of four children born to Casper and Marguerite (née Fuchs) Heurich. Christian’s father, was the local innkeeper which included being a butcher and brewer. Christian learned the trade from his father, in addition to several apprenticeships in his youth. By the time Christian was fourteen years both of his parents died, leaving him orphaned. He traveled throughout Europe until his older sister, Elizabeth Jacobsen, who was living in Baltimore, Maryland, convinced him to emigrate to the United States, where he would have a better chance of fulfilling his dream of starting his own brewery; he arrived in June 1866, initially joining his sister in Baltimore. In 1872, Christian went into a partnership with a man named Paul Ritter. Together, they leased a brewery from George Schnell at 1219 20th Street, NW Washington, D.C. Within a year, Mr. Schnell had died and the partnership between the two men had dissolved. In his 1934 autobiography, Aus meinem Leben Heurich writes that he was the one that did most of the labor of brewing, while Schnell entertained customers. Christian married the widow of Mr. Schnell, Amelia Mueller Schnell on September 9, 1873. In 1884, Amelia died of pneumonia. in 1887, Christian married for the second time to Mathilde Daetz. It was with Mathilde that he built their lavish mansion at 1307 New Hampshire Avenue NW Mathilde worked very closely with the interior designers of the house, The Huber Brothers, NYC. Sadly, due to miscarriage and a carriage accident, Mathilde died in 1895, leaving Christian a widower once again. Christian threw himself into his work, creating an empire in the capital city. In 1894 he opened his new, fireproof brewery which had a capacity for 500,000 barrels of beer a year. The brewery, which rested on the Potomac River is now the site of the Kennedy Center for the Performing Arts. 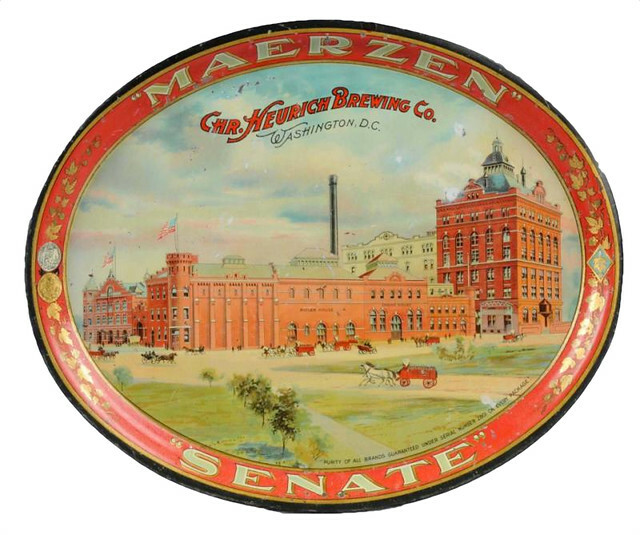 The Christian Heurich Brewing Company was the second largest employer in Washington D.C. during this time, apart from the Federal Government. In 1899, Christian married Amelia Louise Keyser, the niece and namesake of his first wife. Twenty-nine years her senior, together they had four children, three of whom survived into adulthood, Christian Heurich Jr, Anna Marguerite (died as infant), Anita Augusta and Karla Louise. Together, they had a long marriage until Christian Heurich Sr died in 1945 at the age of 102. Photo from the Heurich House Museum. Christian Heurich Sr. was born on September 12, 1842, in the small farming village of Haina in the Duchy of Saxe-Meiningen. He was the third of four children, two boys and two girls. His parents, Casper and Margarete Fuchs Heurich, ran an inn in the village. At the time of his birth, they were tenants in what he later described as “an old castle” belonging to the University of Würzburg. As a boy, Heurich attended a school where one teacher taught several dozen students ranging from six to fourteen years of age. When he was twelve, his family moved a few kilometers away to Römhild, where his father purchased another inn and Heurich attended a new school, excelling in mathematics. In 1857, he graduated at the top of his class. At the time, he was almost fifteen, the age when adolescent males usually began their apprenticeships. The year before Heurich finished school, his mother died and his father fell ill. Management of the inn “passed into other hands” and, although Casper Heinrich had arranged for the family to continue living there, the children began to depart one by one. Heurich’s older sister, Elisabeth Adelipa, emigrated to the United States with family friends; his older brother, August Friedrich, married and took in Heurich and his younger sister. After graduating, Heurich was apprenticed to an innkeeper in the town of Themar, about fifteen kilometers to the north. There he learned not only how to brew beer but also how to butcher – two essential skills for innkeepers. Since lighter-colored lager beers developed in Bavaria and Vienna in the early nineteenth century were quite popular at the time, these beers may have been among the first he learned to make. In any event, it was a type of beer that he would later brew to his great advantage in the U.S.
Of all the cities he visited, Heurich loved Vienna the most. He later wrote of that “wonderful city” and said he “warmed to its beauty, its leisure, its culture.” He had, he noted, “passed ‘the most beautiful time of my life in Vienna.’” Heurich worked in several Viennese breweries as a brewer and a cellarer. He continued to learn different ways to make beer and planned to eventually open his own brewery. It was this dream, in fact, that prompted him to leave Vienna in the end. Elisabeth, his sister in America, explained that whereas he might never be able to open a new brewery in Vienna, there was ample opportunity to start his own business in America. After immigrating to the United States in 1859, Elisabeth met and married Hermann Jacobsen in Baltimore. From there, she wrote to Heurich often, trying to persuade him to move to the U.S. to start his own brewery. After the American Civil War ended in 1865, Elisabeth “became more insistent,” noting that “Germans … were opening breweries all over the country. 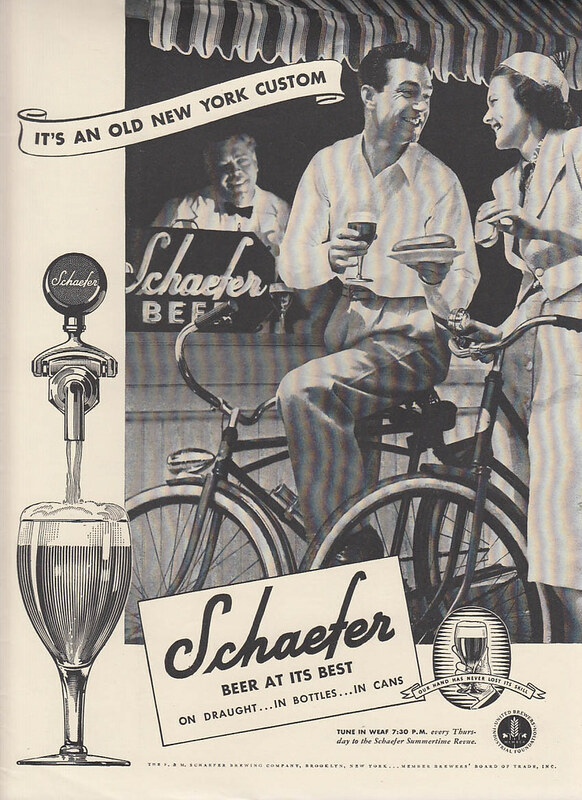 Americans were … going in for the lighter, healthier and more sustaining beverages introduced and almost daily being improved on by my own countrymen.” In other words, Americans were drinking more lager beer. Elisabeth’s letters to Heurich were typical of the “America letters” that immigrants sent home for generations. She praised her new country, stressed that the new world offered greater opportunity than the old, and she undoubtedly promised him help in starting a new life. The Helvetia left Liverpool the second time at the end of May and arrived in New York on June 11, 1866. [Heurich did a little sightseeing and then took a train to Baltimore to find Elisabeth and her husband Captain Jacobsen, the master of a small sailing ship that carried grain and fruit between Baltimore and the West Indies. The couple lived on Canton Avenue near Fells Point by the waterfront. This area had been home to mariners and those who built, repaired, and supplied ships since the eighteenth century. Back then, a quarter of the city’s 200,000 residents were either German immigrants or of German ancestry, and the area around Fells Point was one of the wards with the heaviest German population. Baltimore was a good place for Heurich to refine his brewing skills. In 1867, the U.S. had an estimated 3,700 breweries, and Baltimore was home to forty-five. The number was in constant flux as breweries opened, merged, closed, and reopened. Then the fourth largest city in the country, Baltimore had a large and growing population of German immigrants who were well represented in the local brewing industry. By the late 1860s, Americans had begun to acquire a taste for lighter German lager beers, which had been introduced in the U.S. in the 1840s, and newly arrived German immigrants with brewing industry experience quickly found a niche in satisfying this new taste. Heurich was one of many to take advantage of this opportunity. The German community took an active role in greeting new arrivals. For example, the Baltimore German Society, established in 1783, distributed food and clothing to new German immigrants, and helped them find housing and doctors. Additionally, its employment agency, founded in 1845, helped thousands of newcomers find jobs. Heurich quickly found a job at Röst’s brewery, one of the first lager breweries. Its owner, the Bavarian-born George Röst, was an established member of Baltimore’s German community. He hosted traditional German immigrant societies, including a shooting society [Schützenverein], and held various events at the picnic grounds and beer garden adjacent to the brewery. Though no records exist to confirm this, it could very well be that Heurich found the position at Röst’s through the Baltimore German Society. Heurich spent a little over a year in Baltimore. In the spring of 1867, he received his first citizenship papers, which declared his intention to become a U.S. citizen. Soon thereafter, he began working as the foreman of the malt house at Seegar’s Brewery. He believed that he owed this job largely to his “good grasp” of English. He worked there briefly and then headed west in search of better opportunities and a chance to move outside the immigrant community that, in his mind, was preventing him from perfecting his English. His first stop was Chicago, where he worked briefly for Seipp and Lehmann, a rapidly growing brewery that produced about 300,000 barrels a year in 1867. But Chicago, with is large German-American population, was not the best place to move out of the German community. Taking this step was important to Heurich, because he wanted to perfect his English skills before starting his own business, so by 1868 he was living with a cousin near Topeka, Kansas. Heurich’s cousin and his family had been living in Kansas since the mid 1850s. They had been supported, Heurich claimed, by a New England abolitionist group during the struggle to determine whether Kansas would be a free or a slave state. The family had prospered and Heurich enjoyed living there, although he was a farm worker and not a brewer. Most of the people in the area were native English speakers and his language skills improved. Heurich liked to tell the story of how, during his Kansas stay, he cast his one and only vote for president – that vote being for Ulysses S. Grant in the election of 1868. At the time, immigrants were often allowed to vote if they swore that they intended to become citizens. Because Heurich spent most of the rest of his life as a resident of Washington, DC, he was unable to cast another vote in a presidential election, because residents of the “federal city” were excluded from voting in presidential elections until 1964. Heurich moved back east in the spring of 1869 and complained of a recurring fever. He lived for a time with family members in Illinois but did not show any improvement. He also spent time in nearby St. Louis, Missouri, where he heard a young Joseph Pulitzer speak at a rally. Heurich was so impressed that he decided to translate Pulitzer’s articles from the Westliche Post into English for practice. He also found a job at a local brewery. Heurich’s health did not improve, however, and, as he put it, he “reluctantly” returned to Baltimore in the summer of 1869. By then, he had spent three years in the U.S., had worked in several breweries, had seen several major cities in the eastern half of the country, but had not yet found a chance to open his own brewery. Back in Maryland, his brother-in-law suggested that he might regain his health at sea, so Heurich signed on as a common seaman, a “banana roustabout,” on his brother-in-law’s small ship. He suffered severe seasickness, but kept at his work. By the time the ship returned from its Caribbean run, Heurich‘s fever was gone and he had visited several new places, including Jamaica. Still, he gladly abandoned his brief career as a sailor to restart his interrupted career as a brewer. He accepted a position as brewmaster at a new brewery in Ripley, Ohio. The brewery only operated for a few months because it was, in Heurich’s words, “not run properly and came to a ‘blow-up.’” After returning to Baltimore, he went back to work at Seegar’s Brewery as the foreman of the malt house. 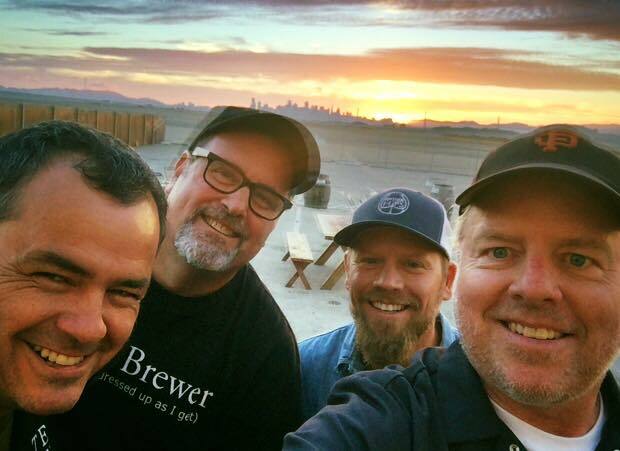 While at Seegar’s, Heurich was approached by its brewmaster, Paul Ritter, who suggested that they go into business together and buy a brewery. Heurich agreed. He had already been scouring the mid-Atlantic area for a suitable location, and had settled on Washington, DC. Washington’s population had increased dramatically during the Civil War and boasted 131,000 residents in 1870. The city was also undergoing a burst of new development sparked by the creation of a territorial government in 1871. The most important member of this new government was vice-chair of the DC Board of Public Works, Alexander Shepherd. During his tenure as vice-chair (1871-73) and his subsequent term as Washington’s second governor (1873-74), Shepherd rebuilt the city, paving roads, adding sewer and gas lines, installing street lights, and filling in the old canal that had become a fetid sewer. He established the city’s first public transportation system (horse-drawn trolleys) and planted 60,000 trees. The city also began creating parks and filling the swampland south of Pennsylvania Avenue. As a result, early 1870s Washington must have looked like the perfect place to establish a new business. Moreover, there was the added bonus of not having to compete with powerful established competitors. 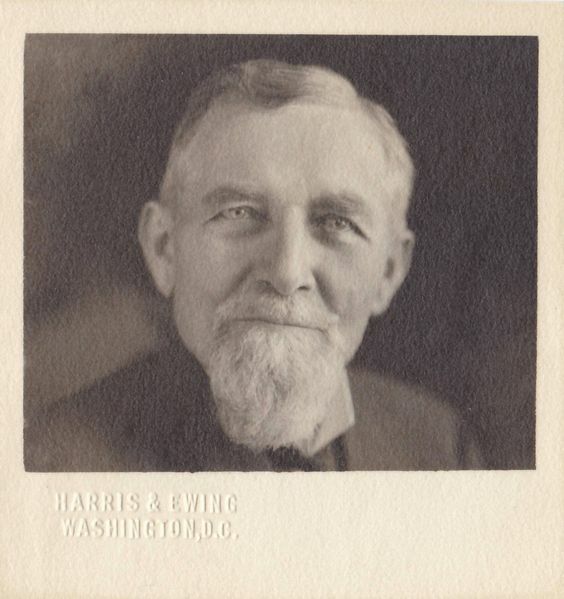 In his memoirs, Heurich referred to Shepherd as “God’s gift to Washington at a sorely needed time,” and a 1942 Heurich beer advertisement called him one of “Washington History’s Heroes” for developing neighborhoods that were home to the city’s full-time residents and businesses. Although Washington’s founders had wanted the city to be a place for both government and business, the former predominated, and Washington lagged far behind nearby Baltimore economically. But with the infrastructure built by Shepherd, it seemed as though the city might finally become an industrial center. Heurich was one of many business leaders who wanted to make this a reality and thus fulfill the founders’ vision for Washington, DC. The city must have appealed to many men with similar skills, because over a dozen new breweries besides Heurich’s opened in Washington in the 1870s. Some failed quickly and others sprang up to replace them. Additionally, there were two breweries across the river in Alexandria, Virginia, one of which, Robert Portner’s, eventually became one of the largest breweries in the South. Breweries in Baltimore and Cumberland, Maryland, were too far away to compete with those in the District, but Heurich and Ritter still had more than enough local competitors to contend with. Washington had a small, but lively, German-American population of about 5,000 residents, or about three percent of the population. There were a number of active German-American organizations, such as the Columbia-Turn-Verein (a gymnastics club), which hosted balls, theater productions, English classes, and other courses. There was also a Sängerbund, or singing club, and two Schützen-Vereine (shooting clubs), each of which owned a park. In addition, the German-American community supported boating clubs, a fishing club, and other organizations that entertained the general public as well. Washington, DC, was also home to two German newspapers and numerous Catholic and Protestant churches as well as a Jewish synagogue. Thus, Heurich and Ritter were moving to a city where they would find an established immigrant community. In September 1872, the two partners put up about $1,000 each (approximately $18,400 in 2010) to form Ritter and Heurich. They rented the Schnell Brewery and Tavern on 20th Street NW between M and N Streets for $1,600 a year (approximately $29,500 in 2010). Founded by George Schnell in 1864, the brewery produced about 500 barrels of wheat (or weiss) beer per year, much of which was sold at its adjacent tavern and beer garden. According to Heurich, the brewery was “run-down,” so they purchased new equipment. They were brewing a month later. Ritter worked as a salesman and bookkeeper, and Heurich brewed the beer. In his memoirs, Heurich noted that “Frank,” described as an “aged colored man,” was kept on as deliveryman and porter. The two partners lived in an attached house on 20th Street, and Ritter’s wife tended to a small nearby barroom where their beer was sold. Heurich switched the brewery from weiss beer to the barley-based, light lager he had learned to brew as a journeyman in Europe. The brewery began to catch on, but the partnership quickly dissolved. Heurich never specified why the break occurred, but he noted in his memoirs that “right was on my side.” It is possible that Heurich may have thought that Ritter was taking too much credit for the brewery’s excellent beer, since Heurich always stayed behind to work in the brew house while Ritter went out to sell the product. Whatever the reason for the break, Heurich bought out Ritter and started running the business by himself. At the time, he was producing two beers, “Senate,” a light lager, and Maerzen, “a full bodied dark brew.” He often worked eighteen-hour days to meet the demand for his beer, which proved so popular that he had to put customers on a waiting list. But who were these customers? The Washington elite tended to live and work near Pennsylvania Avenue and in expensive nearby neighborhoods such as Georgetown. Heurich’s brewery was slightly north of the area where the wealthy and powerful lived in 1872, and his customers came from the local neighborhood. Heurich noted that the “lower [classes] when their day of toil was done, clung closely to the little beer taverns and restaurants of their neighborhoods.” Historian Jon Kingsdale noted how saloons acted as a “poor man’s club.” “In its most encompassing function,” he explained, “the saloon served many workingmen as a second home [and the] middle-class male [could retire] to the corner saloon to meet his friends….” Heurich tapped into this market in what was a rapidly growing urban area. He also tapped into the growing restaurant and hotel scene, which was expanding along with the city. With Ritter and his wife out of the picture, Heurich had to run the brewery himself. Elisabeth came down from Baltimore to help and encouraged Heurich to find a wife. Heurich told his sister that he had a girl in mind but thought he was too busy to be married. Elisabeth suggested that he ask the girl anyway. Heurich agreed, mustered his courage, and, after being literally pushed out of his house by Elisabeth, “dashed” to his next-door neighbor, August Mueller, who farmed the land by Dupont Circle next to Heurich’s brewery. Heurich proposed to Mueller’s daughter, Amelia, who immediately accepted. Amelia was not only Heurich’s neighbor, she also was the widow of George Schnell, who had leased the brewery to Heurich. Schnell had died in November 1872, leaving everything to his wife. Heurich and Amelia were married on September 9, 1873. Heurich was a few days shy of his thirty-first birthday, and his bride was almost a year older. September 1873 was a month of both personal and historical turning points; it saw not only Heurich’s wedding but also the beginning of a global depression. Changes in the worldwide silver market had already weakened the U.S. economy when American financier Jay Cooke’s Northern Pacific Railway was forced to declare bankruptcy that month. 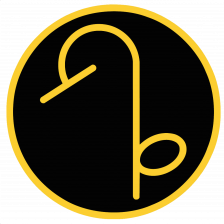 Cooke’s bank was subsequently forced to close, then more banks failed, and the New York stock market collapsed. Throughout the nation, businesses went bankrupt and closed. Heurich noted in his memoirs that his business did not seem to suffer: he continued selling about eight barrels a week and making about $100 weekly (approximately $1,880 in 2010), one third of which was profit. That translated into an average a profit of about $1,700 a year (approximately $32,000 in 2010) at a time when the average annual wage for a U.S. worker was about $384 a year (approximately $7,220 in 2010). So Heurich’s business – still small-scale and local in nature – was doing very well. 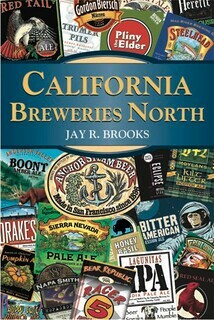 He continued to do most of the work himself, acting as brewer, salesman, and deliveryman. He lived at his 20th Street brewery with Amelia, a female servant, and several workers. In his second year of business, Heurich added six more employees, who, in the German craft tradition, lived with the family. As his business expanded, Heurich not only hired more workers but also brought relatives and others over from Germany. They sometimes paid their passage with their labor upon arrival. In early 1878, Heurich was invited to join the board of directors of Washington’s German-American National Savings Bank, which had been founded the year before. He was exceptionally proud of the fact that, after only a few years in business, he had entered the ranks of the city’s leading businessmen. In letters to his family back in Germany, he bragged of his success, not only as a brewer, but also as a bank director. On this last point, he might very well have overstated his success, given that it was a small bank. Whatever the case, his good fortune was fleeting, as the bank collapsed in autumn of that same year. Heurich and another board member, Christian Ruppert, assumed responsibility for covering the bank’s losses to its depositors. The bank president and a cashier were tried on embezzlement charges and, although convicted, were released on account of mistakes made by the prosecution. In his memoirs, Heurich claims they were acquitted, but hints that he disagreed with the verdict. Nevertheless, many major shareholders had already lost their fortunes in the depression of the 1870s. Heurich took out insurance on his businesses, borrowed from the insurance company to pay off creditors, and then worked even harder to expand his business to pay back the loans from the insurance company. Heurich bragged in his memoirs that he “literally saved that bank with a tidal wave of beer.” Throughout the rest of his long life, Heurich refused to serve on another bank board, and he invested in local real estate instead. One of the area’s largest landowners, second only to the federal government, he capitalized on the city’s growth by purchasing scattered plots of land, including several in the southwest quadrant, where he built his brewery in the 1890s. He also bought enough land in Maryland, just outside the DC border, to build a dairy farm and a second home. Despite the economic strain of the Long Depression that had started in 1873, Heurich continued to expand his brewery. The White House had begun to buy his beer, and his customer base was growing. On a warm summer night in July 1878, he celebrated the opening of an expanded brewery on 20th Street with a party for 1,000 guests. 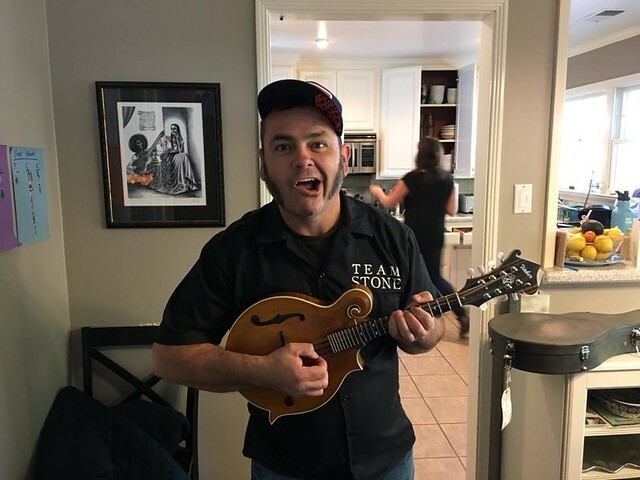 He had twenty men working for him, a half-dozen delivery teams, and he had built an addition next to his home and the brewery to house the extra workers. Heurich’s hard work paid off as his brewing business and real estate investments continued to grow. Heurich’s wife, Amelia, also began to suffer from poor health and a long series of illnesses, and she went to Baltimore to stay with his family. In September 1884, Amelia died of pneumonia at age forty-four. A distraught Heurich buried himself in his work and, on doctor’s orders, made another trip to Germany to take the “cold water cure” at Elgersburg, in Saxe-Gotha. His Washington doctor suggested that Heurich purchase a farm so he could enjoy fresh air while still remaining close enough to the District to keep an eye on his business. He ended up purchasing land near Hyattsville, Maryland, only eight miles from his brewery on 20th street. Heurich named the farm Bellevue, and it remained his country home for the rest of his life. Heurich had the farm’s silos – a long-time fire threat in farms of that era – built out of concrete to make them fireproof. At the time, building with concrete was still relatively new. In the early 1890s, he would take a similar approach when he built a new home in the city and a new brewery. In 1887, Heurich married a second time, to Mathilde Daetz, sister of August Daetz, the brewery’s secretary and treasurer. Mathilde had moved to the U.S. from Germany in 1886. The marriage was generally happy, although it was marred by the death of their unborn child in 1889. To recuperate from the ordeal, the Heurichs traveled to Germany in 1889 and 1890 where Mathilde tried to regain her health. Then, in 1893, she was seriously injured after being thrown from a horse-drawn carriage. She never fully recovered and died at age thirty-three in January 1895, leaving Heurich a widower for a second time. Heurich again lost himself in his work. In January 1899, he married his third wife, Amelia Louise Keyser, the niece of his first wife, whom he had known since she was a child. A native of Richmond, Virginia, she lived and worked in Washington. Twenty-one years Heurich’s junior, she had to remember not to call her new husband “uncle” at first. They had four children, a son and three daughters. One daughter died as an infant, but the others survived to adulthood, and their son, Christian Heurich Jr., born in 1901, took over the brewery when his father died in 1945. Despite the loss of his first and second wives, Heurich’s business continued to prosper. 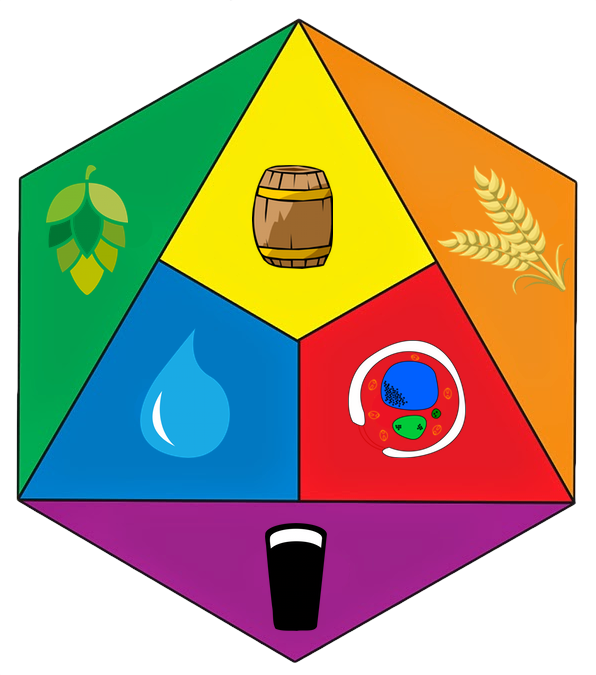 In the late 1880s, the District of Columbia had five established breweries (as well as some smaller ones that came and went). Additionally, there were two more across the river in Rosslyn and Alexandria. But Heurich’s remained one of the largest in the area, along with Portner’s in Alexandria. Bottlers for Pabst and Anheuser-Busch also established themselves in Washington, so competition was plentiful. In 1887, the Department of Agriculture ran tests for chemical adulterants and impurities in beer sold in Washington. The report announced that some of the beers included salicylic acid, bicarbonate of soda, and sulphite. The report named no specific beers, but Heurich knew that his beer did not contain these additives or other “impurities.” Still, it took the intervention of a friendly congressman, Jacob Romeis (R-Ohio), to force the Department of Agriculture to release the results for Heurich’s beer. They had tested two bottles and neither contained any impurities or malt substitutes. Beginning in 1891, Heurich ran advertisements boasting that his beer had “a record of purity that challenges the world.” The campaign continued for several years. Heurich also tried to distance himself from saloons that served distilled liquor. The saloon attached to Heurich’s brewery served only his own products and no hard liquor. And, unlike many bars in the area, Heurich’s saloon was furnished with tables and chairs. In this respect, it more closely resembled a traditional German beer hall than an American saloon, since many of the latter did not provide seating for customers. By 1890, Heurich and his family were a part of the Washington business elite. He was active as a businessman and a philanthropist in both the German immigrant community and in Washington society as a whole. He served on the Board of Directors of both the German Orphan Asylum and the Eleanor Ruppert Home for the Aged and Indigent Residents. He was also active in the Chamber of Commerce and the DC Board of Trade. These latter two are of particular importance because, in the absence of an elected District government, these businessmen’s organizations acted as unofficial lobbyists for Washington in Congress by promoting the city’s financial and business interests. Heurich decided to build a new home and a new brewery. The new home would remain near 20th Street and would occupy the two New Hampshire Avenue lots (just off Dupont Circle) that his first wife had bought in 1879. Several factors prompted Heurich to move his brewery to a new location. Growing prohibitionist sentiment within the anti-saloon movement meant that Heurich was under greater pressure to close his 20th Street brewery, which was in a fast-growing residential area. Moreover, Pacific Circle (renamed Dupont Circle in 1882) was becoming a neighborhood of expensive homes, making industry even less welcome in the immediate vicinity. As Heurich later noted, “There were neighbors all around me who declared they objected to the healthy smell of good hops and barley.” Additionally, a series of fires had damaged the brewery, making expensive repairs necessary. In 1892, a fire caused by an explosion in the malt mill swept through the structure, destroying most of the brewery. It even damaged some of the beer in storage. The loss to the stored malt alone, not to mention the rest of the brewery, totaled approximately $20,000 (approximately $494,000 in 2010), enough to put the survival of the business in doubt. This was the third fire since 1875, the previous ones having been started by a chimney spark and a worker smoking in the stables. Recurring fires and the changing neighborhood prompted Heurich to build a fireproof facility in a different part of the city. In 1894, workers started construction on a new, larger brewery by the Potomac River at 26th and D Streets. The new brewery was completed in 1895; it offered room to expand to a possible capacity of 500,000 barrels annually, up from 30,000 at his 20th Street facility, and it housed an ice plant that could produce 150 tons a day. His business did not take immediate advantage of the extra capacity, but Heurich was evidently prepared for greater sales volume in the future. While the new brewery buildings were being built, the old facility was used to age the beer previously brewed until it was ready for sale, thus reducing the disruption in business. Once the new brewery was ready, the original one was abandoned. Three years later, Heurich added a bottling operation to the new plant, and this made it easier for him to sell his beers a bit further from the city. In 1914, the old ice plant was turned into storage and a new ice plant was constructed that could produce 250 tons a day. Heurich produced “can ice” intended for ice company delivery to homes, and “plate ice” which was meant for large commercial refrigerators. He also added bottling plants in Norfolk and Baltimore, which expanded his customer base beyond DC and into much of Virginia and Maryland as well. However, he did not expand beyond the states neighboring Washington. This was not unusual. 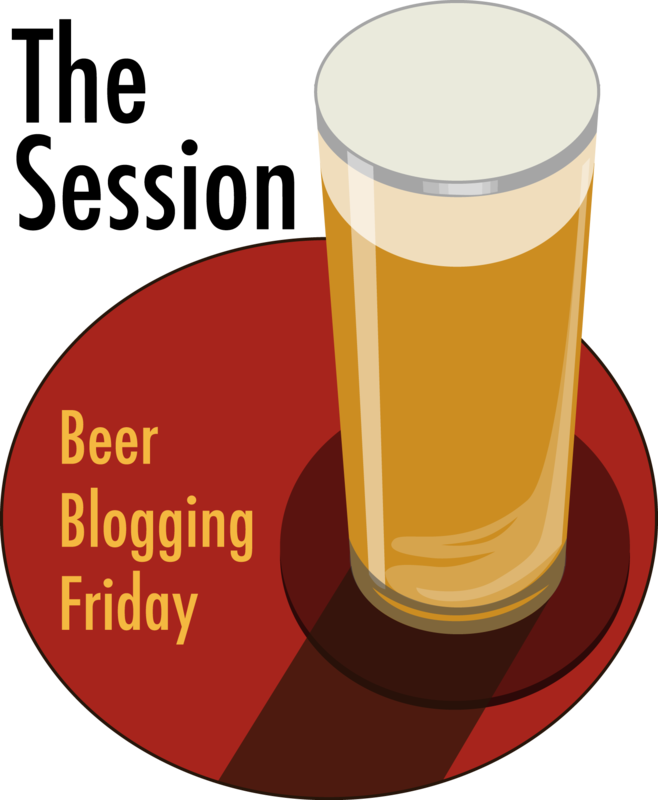 Only a few breweries were successful at expanding their market beyond a day’s trip by rail. Beer was still commonly shipped in barrels and was often bottled at the destination by a local bottler. Moreover, shipping beer required use of expensive refrigeration cars. 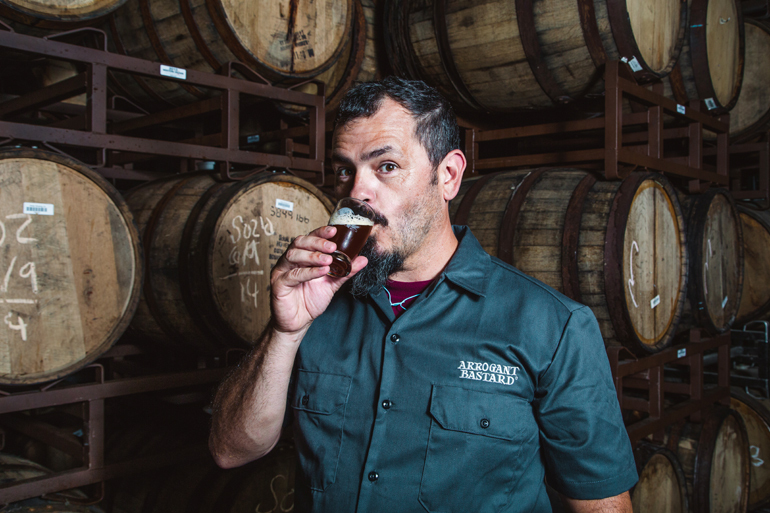 Although Alexandria’s Robert Portner expanded throughout the South, most brewers had all the business they could handle serving their local area. At the same time that Heurich built his new brewery, he also had a large mansion built in Dupont Circle. Made of concrete and steel, it was Washington’s first fireproof house. Heurich lived in the thirty-one-room house with his third wife, their children, and their servants. The unmarried female servants, all German, lived on the top (fourth) floor. Heurich tapped into the local community of German craftsmen for the woodwork, masonry, and ironwork that decorated the home. His fear of losing another building to fire prevented him from using any of the mansion’s many fireplaces. Heurich even went so far as to have a sculpture of a salamander placed atop the mansion’s roof, because, according to classical Greek literature, salamanders were resistant to fire. Heurich and his family lived in a mansion in a wealthy section of the city, but all of his children attended Washington’s public schools, and their home life was a mixture of American and German customs. The children’s governess was German, but the entire family spoke both German and English at home. Heurich spoke German with his family up until World War One, at which point he switched entirely to English. Near the end of Heurich’s life, however, his family switched back to German. He was hard of hearing, and found it easier to understand his native language. The family followed the old German custom of erecting a Christmas tree, but by 1900 many wealthy and middle-class American families did so as well. The family also kept dachshunds as family pets, even though the breed fell out of favor among Americans during the First World War. They were not only a German breed but also a known favorite of Kaiser Wilhelm II, and this made them doubly unpopular. The Heurichs’ pets slept at the top of the stairs at night, watching over the family. When World War I broke out in August 1914, Heurich and his family were on their way to Germany for a vacation. Like thousands of other American citizens, they found themselves neutrals in a war zone with no easy way to get back home. The U.S. embassy in Berlin was swamped with Americans needing money, tickets, and even passports, which had not been needed to travel during peacetime, but which became necessary once war broke out. Like other Americans, Heurich found himself strapped for cash as banks refused to cash checks from foreigners, and Heurich was no longer a German citizen. Heurich was still, however, a favorite son of Römhild, and the city government guaranteed any money Heurich needed. Friends in Berlin promised to help and he was able to book passage on a Dutch ship leaving Amsterdam. Other Americans also trapped in Nuremberg formed committees to deal with the German government and often relied on Heurich to use whatever influence he might have as a German native. Finally, he managed to arrange for a train to take the Americans from Munich to Rotterdam. Once there, Heurich found that “we had no reservations although we had been given reservations.” A ship, the New Amsterdam, was scheduled to leave in two weeks, and they managed to book passage. Heurich was forced to reserve an “evil smelling little cabin” and complained that the price “was out of all proportion to prevailing steamship passage costs.” Still, Heurich later noted, “I would have chartered a ship for myself and my family if necessary – and would have told them to take the brewery in exchange if I had to.” “I was going,” he remembered, “to get away from here and get home . . . . ” The ship was stopped more than once by British navy ships and inspected. When the British boarded, Heurich recalled, “I came in for their particular attention as my passport showed plainly that though an American citizen in good standing, I was nevertheless a native of the country with which their country was at war.” After a ten-day trip, Heurich and his family reached New York. 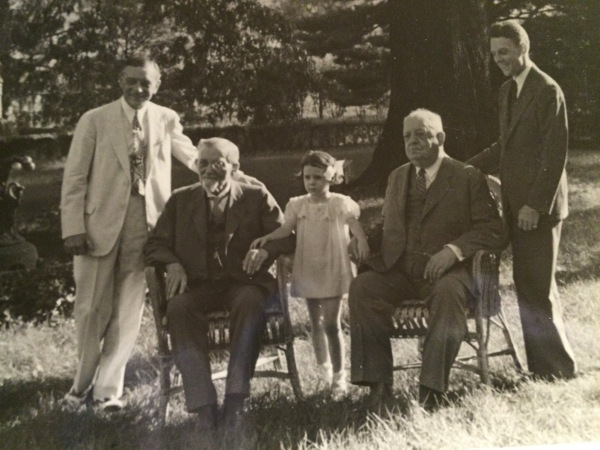 From Left: Charles F. Jacobsen, Christian Heurich Sr., Karla Jacobsen, Charles P. Jacobsen, Christian Jacobsen taken at the Heurich Family Farm around 1940. Photo from the Heurich House Museum. Once back in the U.S., Heurich had to deal with the growing prohibition movement, which was gaining strength throughout most of the nation. In 1914, Virginia voted to go dry beginning in November 1916, thus cutting off a large part of Heurich’s market. Even worse, Washington, DC, went dry soon thereafter. The lame duck 64th Congress (1915-17) met for a final time at the end of 1916 and early 1917, and passed several prohibition laws. One of the first was the Sheppard Act – named after dry Senator John Morris Sheppard of Texas – which made Washington totally dry, banning any alcoholic beverage outside of the home. Opponents tried to derail the law by asking for a referendum to allow the citizens of Washington to vote for or against the law. Congress refused to allow such a referendum, and President Woodrow Wilson sided with Congress, noting that there was no mechanism for such a vote. In his January 15, 1917, press conference he told a reporter: “You see, there is no voting machinery in the District of Columbia. It would have to be created. There are some practical difficulties about it.” The drys continued lobbying and the bill finally passed. Once the Sheppard Bill passed, opponents began lobbying President Wilson to veto the law. American Federation of Labor President (and Wilson political ally) Samuel Gompers visited Wilson and pressed him to kill the bill noting that beer was the working man’s beverage. However, on March 3, 1917, Wilson signed the bill, saying that Congress had been given police powers for the District so the law fell within Congressional responsibilities. Disappointed wets did not give up, however, and seven saloon-keepers filed suit with the District Supreme Court. The plaintiffs claimed that by selling them licenses the District government had recognized the saloon-keepers’ right to sell liquor and that the Sheppard Act therefore violated their property rights. The District of Columbia Supreme Court refused to consider the claim stating that the internal revenue license was, in fact, a tax, and did not actually guarantee the right to sell intoxicants. The ruling judge noted that the U.S. Supreme Court earlier had ruled that there were no rights to property involved in selling liquor, and that public health and safety rights took precedence. By 1917, the Prohibition movement had so much political influence in both major parties that even the politically influential German-American community could not influence Congress. Washington’s German community opposed the measure, but it came at a time when they had little political influence and larger problems due to the impending U.S. entry into World War I. Germany declared unrestricted submarine warfare on January 31, 1917, and President Wilson asked Congress to declare war on April 2. The two intervening months were marked by anti-German hysteria in the District of Columbia, as German immigrants were subject to numerous rumors of spying and sabotage. Moreover, Washington’s business leaders were handicapped when it came to influencing policy, as the city had no representation in Congress and thus little clout. While they could lobby members of the House and Senate committees that oversaw the federal city, Congress had long been accustomed to treating Washington as its personal fiefdom. With no votes to promise or withhold, the District’s business leaders had nothing to offer members of Congress. Not one to wait for events to overtake him, Heurich attempted to prepare for the coming of Prohibition and kept his business running and his workers employed as long as he could. In August 1917, a few months before the law took effect, he tried making a non-alcoholic fruit drink. He purchased $100,000 worth of apples (approximately $1,700,000 in 2010) and stored the mash in sterilized beer barrels. After adding some hops the drink was ready for sale. Like many Americans, Heurich was eager to show support for the wartime effort and gave his product an “American” name as opposed to a German one. Just as sauerkraut became “liberty cabbage,” Heurich’s new drink was named “Liberty Apple Champagne.” To the brewer’s chagrin, however, his new beverage fermented and he was unable to keep it on the market as a non-alcoholic beverage. He placed it in storage in the hopes that someday he could sell it. In January 1920, shortly before national prohibition started, Heurich was given permission to sell as much of his stock of Liberty Apple Champagne as he could. He sold about one-third of his supply even though customers had to come to the brewery to pick it up. Some of it went to the White House. According to report (sic) around Washington, it was found that the principal man (Heurich) concerned had built concrete foundations for German siege guns on his country estate outside the city, placed to enable them to demolish the Capitol and disguised as fish ponds or similar landscape gardening, and that a secret wireless outfit was found on the estate, with which he had secured valuable information and conveyed it to the enemy. The Times article continued by stating that an “officer of the Secret Service” said he “paid no attention” to this and similar reports. In reality, the “concrete foundations” were the burial vault for Heurich’s second wife, Mathilde, who had died in 1895. Heurich noted in a statement to the press that his “loyalty as a citizen was so far beyond question that he regarded the sensational rumors as being beneath his notice.” This did not quell the rumors. In his memoirs, Heurich wrote that stories of his disloyalty were rife during the war. “I was,” he wrote, “in the opinion of these people, a master spy, an intriguer, a German propagandist, a fearful and dangerous person.” Besides the rumors of the gun emplacements, Heurich recounted inviting writers at a newspaper that claimed he had built a wireless station to transmit secret messages to Germany to inspect his property for such a facility, an offer the paper failed to accept. The same paper later reported erroneously that the brewer had committed suicide, insinuating guilt. When Heurich contacted the paper to protest, the editor offered to print a retraction but Heurich told him to “let me remain dead. Leave me in my grave where you have got me for the remainder of the war, and I won’t sue you.” In the end, Heurich spent the rest of the war on his nearby Maryland farm, Bellevue. Although it was adversely affected, Washington’s German-American community did not suffer the violence witnessed in other parts of the U.S. during the war. Non-naturalized German immigrants were deemed “enemy aliens” and deported from Washington to cities in the Midwest to distance them from the capital. Several local churches stopped giving sermons in German. The local Sängerbund first replaced German songs with English ones and then suspended all of its activities in 1918. It went bankrupt after the war. Washington schools eliminated German language courses in 1918 after enrollment dropped. Heurich’s ten-year-old daughter complained that her friends would no longer play with her, and that they taunted her with the slur “Hun.” Heurich later wrote that, being of German birth, he had to beware of “people intent on witch-burning.” He was careful not to “express opinions of any sort” and was mindful of how he spoke. During the First World War, the Eighteenth Amendment to the Constitution, which banned “the manufacture, sale, or transportation of intoxicating liquors within, the importation thereof into, or the exportation thereof from the United States” passed Congress. It was ratified in January 1919 and went into effect a year after ratification when the Volstead Act defined “intoxicating” as 0.5 percent alcohol by volume. However, wartime prohibition limited the amount of material available to brewers, and made much of the country dry even before the Eighteenth Amendment took effect. Heurich, now in his mid-seventies, remained in semi-retirement after the District went dry in 1917, but his real estate investments more than sufficed to provide a comfortable living. The ice business was not a big moneymaker, but it did allow Heurich to continue providing employment to his workers. Moreover, Heurich had been active his entire life, and he seemed to prefer work to a leisurely retirement. 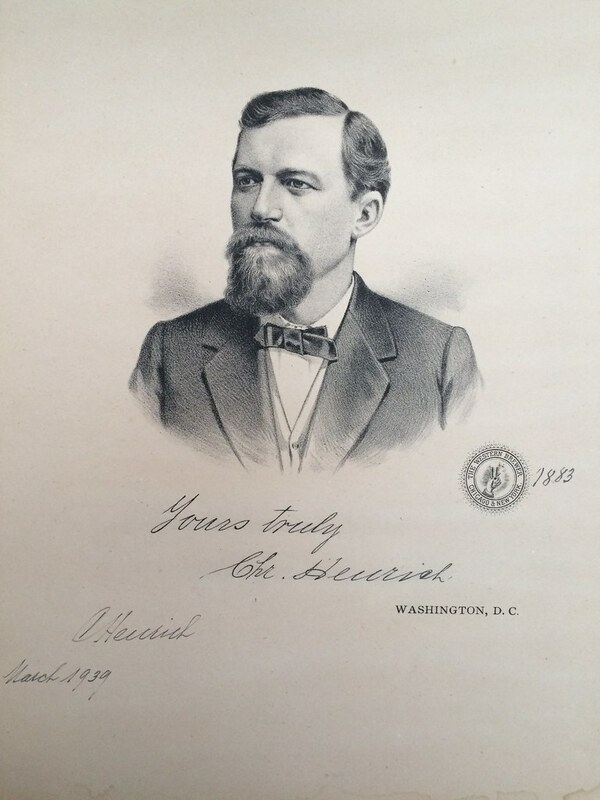 Unlike many other brewers, Heurich did not try to survive by making “near beer” or by making beer and then “forgetting” to remove the alcohol, in effect bootlegging. It appeared that he had made the last batch of Senate beer ever. In March 1933, the Volstead Act was replaced by the Cullen-Harrison Act, which redefined “intoxicating,” making 3.2% beer and wine legal. Heurich, then ninety years old, was welcomed at the White House, where he thanked President Franklin Roosevelt for signing the bill, a far cry from his treatment as an enemy alien in 1917. In December 1933, the Twenty-First Amendment to the Constitution repealed the Eighteenth Amendment, and it became legal to make and sell higher alcohol content beverages again. Heurich originally planned not to return to the beer business, but the tremendous demand for beer convinced him otherwise. 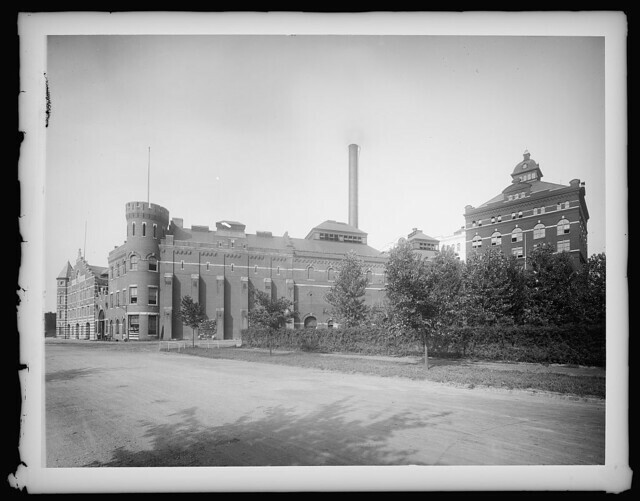 Five breweries had been in operation in Washington when Prohibition began, but only Heurich’s and the Abner-Drury Brewery reopened; the latter only lasted a few years, however. Apparently, the Abner-Drury brewery rushed their beer to market while it was still “green” and acquired a reputation for selling bad beer. Heurich dumped the rest of the hard apple cider he had stored through the dry years in order to free up space for 3.2% beer. He had hoped to sell it, but the only offers he had received were from vinegar companies, and Heurich had too much pride to see some of his product, even cider, turned into vinegar. Heurich sold his beer only after it had aged properly, finally putting it on the market in August 1933. 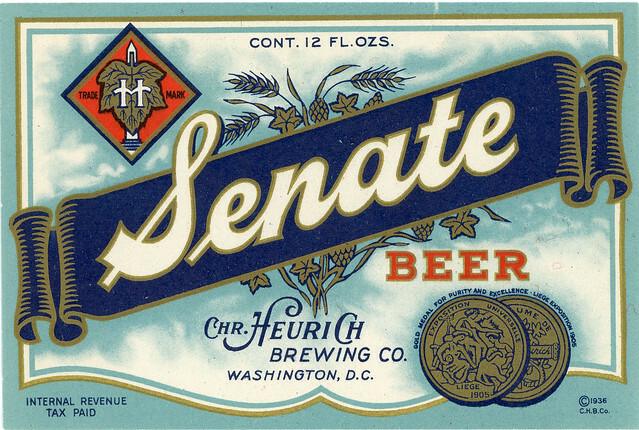 He began selling Senate Beer as his flagship brand, along with Senate Ale, Senate Bock, Heurich Lager, and Maerzen Beer. 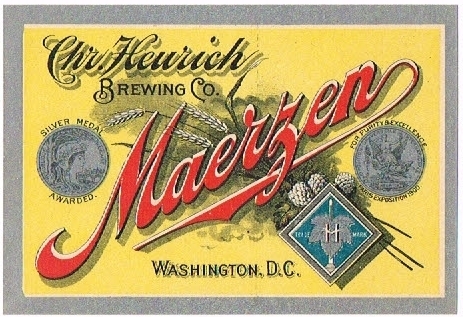 By 1939 Heurich was the only brewer left in Washington, DC. He sold his beer in Maryland, the District, and in northern Virginia, although Washington and its suburbs accounted for most of his business. That year he began canning his beer; canning allowed beer to be cheaply shipped further than before and Heurich found himself in competition not with other local breweries, but with breweries from Baltimore, eastern Pennsylvania, and from the big national breweries Anheuser-Busch, Schlitz, and Pabst. Heurich’s marketing emphasized the traditional skill that went into making his beer rather than local pride – perhaps a reflection of the transient nature of the District’s population, for which local pride did not have as much meaning. In September 1939, Heurich was again in Germany on what would prove to be his final trip. Once again, he found himself in Europe when war broke out. The Heurichs made their way to still neutral Denmark and then to Sweden to catch a ship for home. Heurich passed away before the war was over, so he was never able to travel to Germany again. 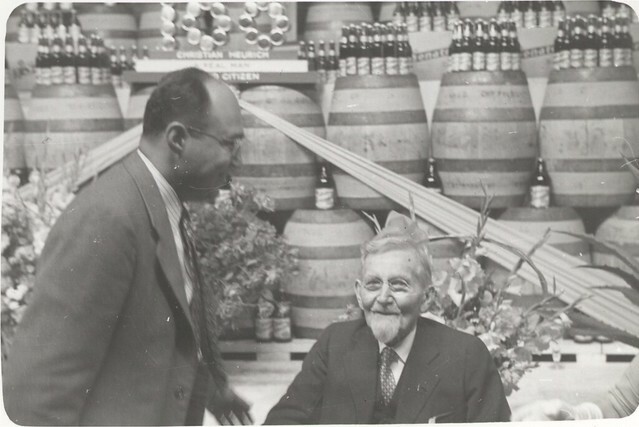 In June 1940, the ninety-seven year old Heurich celebrated his 75th anniversary as a brewer in the United States (this included his time working in Baltimore). Even though Germany was increasingly unpopular in the U.S., Heurich was treated as a grand old man of DC. Over 4,000 people came to the brewery for the celebration, which featured a “mild variety” of Senate Beer. Newspapers ran congratulatory messages on his anniversary and the Times-Herald, the city’s major newspaper, printed a special section on Heurich’s history. It was filled with well wishes from local businesses and civic leaders. When Heurich turned 100 in 1942, local papers covered the celebration, as they did every year. The brewery continued to do well. In 1945, sales reached a peak of 200,000 barrels with about two hundred employees, in part due to the massive influx of servicemen and workers that flooded the capital during the war. The brewery also sponsored company baseball and basketball teams that participated in local leagues. Heurich also made certain that his brewery was overt in its patriotism. In 1940, the brewery closed on October 16th to allow its employees to participate in National Registration Day for the first peacetime draft in American history. During the war, he made the brewery’s gymnasium available for volunteer work, such as mailing ration books. His wartime ads featured symbols of American democracy, such as the Lincoln Memorial. Heurich was not hounded by rumors disparaging his patriotism as he had been during the First World War, but such paranoia was not as evident as it had been in 1917-18. 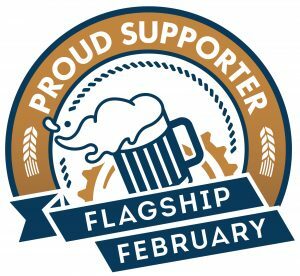 Of course, remembering how Prohibitionists had used the First World War to win support, the brewing industry as a whole was careful to emphasize its patriotism and support of the war. In February 1945, Heurich fell ill with bronchitis. He died in his home on March 7, 1945, at age 102. His funeral service was held at his home, conducted by a local Lutheran minister, and he was buried at Bellevue Farm. The value of Heurich’s estate was set at $3,550,471 at probate (approximately $43,000,000 in 2010), most of which was in the form of property, including the brewery and Bellevue. Christian Heurich, Sr., was one of many German immigrants who succeeded in the brewing industry. Unlike many of the others, however, he was based in an area that did not have a large customer base of either German immigrants or industrial workers. While Heurich was able to tap into an existing German immigrant community, and while he certainly used this community as a source of support, it was too small to support his business singlehandedly. Heurich’s success was only possible because his product appealed to a wide variety of customers – white and black, native-born and immigrant, white-color government clerks and blue-color workers alike. Heurich also benefited from the fact that Washington was a city of transients built around a small, but rapidly growing permanent population. Fellow immigrants, new federal workers, elected officials, African-Americans migrating from the South, and even a growing diplomatic corps flowed into the District at such a rate that the population quintupled from 131,000 in 1870 to approximately 800,000 when Heurich died in 1945. Moreover, Washington was a place where comparatively recent immigrants could move into the ranks of city leaders. In Washington, DC, earning money through industry did not disqualify one from entering elite society, as was often the case in cities with an older, established society, such as New York or Philadelphia. In 1872, Heurich made the decision to move to Washington, as he felt that the city promised certain opportunities. His instincts obviously proved correct. Washington, DC, was indeed an excellent place for a recent immigrant to start a new business and move up in society. Christian Heurich emigrated to American from Germany in 1866 having learned the brewing trade as an apprentice to innkeepers. After coming to the US, he worked in several breweries and spent time on a ship captained by his brother-in-law, all the while learning English. In 1872, he and a partner purchased the old Schnell Brewery and Tavern in Washington on 20th Street NW between M and N Streets. Heurich soon bought out his partner’s share in the business and expanded the facility, often working 18 hour days to fill the demand for his beer. It was so popular he was forced to use a waiting list for his customers. Initially Heurich lived at his 20th Street brewery with his first wife (he was widowed twice before his third marriage), a female servant, a nephew and assorted brewery employees. It was common in the period for factories to have living quarters for the owner and the owner’s family as well as for unmarried employees. Heurich on his 100th birthday. Photo from the Heurich House Museum.